CALGARY, Aug. 10, 2012 /CNW/ - Vermilion Energy Inc. ("Vermilion" or the "Company") (TSX: VET) is pleased to inform investors that an updated corporate presentation highlighting Vermilion's recently announced Duvernay land position has been posted on the Company's website at http://www.vermilionenergy.com/ir/eventspresentations.cfm. As part of its focused New Growth initiative, Vermilion has invested a cumulative $84 million since early 2011 to acquire undeveloped lands in Canada with prospective exposure to emerging shale oil and liquids-rich gas resource opportunities. To date, the Company has actively acquired a total of 408.5 net sections of undeveloped land in Canada. As a result of these acquisitions, the Company now holds several large and contiguous land blocks with prospective exposure to emerging resource plays in Canada including 227 net sections of largely contiguous lands on the Duvernay trend in the Greater Edson area. Vermilion's Duvernay land position extends across the full breadth of the liquids-rich gas fairway and, if successful, is expected to provide condensate yields of between 30 and 300 barrels per million cubic feet. The Company is currently testing its first vertical appraisal well. A significant portion of Vermilion's Duvernay rights underlie the Company's Cardium development area which is expected to yield significant cost advantages that will be further enhanced by the plays proximity to Vermilion's extensive pipeline and processing infrastructure. The Company will also look to leverage extensive pre-existing 3D seismic coverage in its evaluation and testing of the resource. 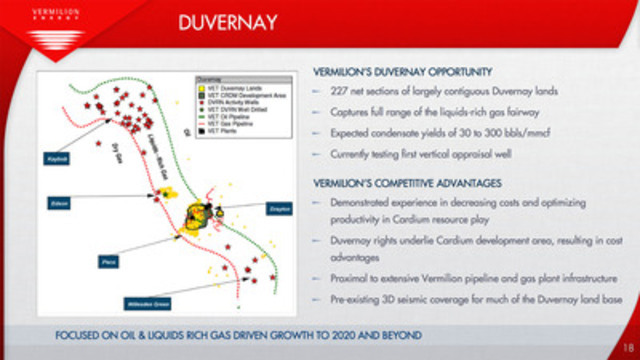 As established during development of its Cardium resource, the Company's competitive advantage will arise from its demonstrated ability to effectively manage full-cycle development costs and optimize productivity as Vermilion progresses from the initial evaluation stages to potential commercial development of the Duvernay resource play.